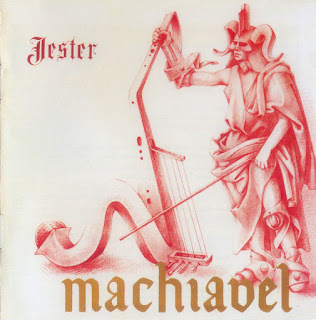 Jester is regarded as Macheavel's greatest album (second in row), and apparently the band benefitted greatly with the addition of vocalist Mario Guccio, who also played some flute, sax, and clarinet. Keyboardist Albert Letecheur really steals the show here with lots of electric piano, string synths, Minimoog, Mellotron and piano, while Roland De Greef provides bass, Marc Ysaye provides drums, and Jean Paul Delvaux provides guitars. "Wisdom" starts off with some pulsing synth sounds, then the string synths and guitar kick in. Some rather dramatic vocals kick in. It's a great piece and a great way to open the album. "Sparkling Jaw" starts off with some spacy synths, in a rather slow manner, but then when the music kicks speed, the Supertramp influence (the electric piano) surfaces. "Moments" is a nice acoustic ballad done prog rock style, this reminds me most of Genesis during their more acoustic moments. The Mellotron rears it's head for the first time on this album here, and the Mellotron would be heard for the remainder of the album. "In the Reign of Queen Pollution" has lyrics that don't exactly need a rocket scientist to understand: about pollution and genetic mutation thanks to the consequence of pollution (including how after a thousand years children were born with the face in the shape of a gas mask). The song appropriately starts off in a rather dark and sinster matter with the string synths dominating. But the music starts picking up, Letecheur gives a nice Moog solo, then the music gets upbeat, for some strange reason, but the music is quite catchy. The title track has more of that Supertramp influence, but then at the end more nice synths that end this piece. "Mr. Street Fair" is a nice spacy piece dominated by string synths, with a circus-like atmosphere. "Rock, Sea and Tree" is the ending piece that has more great creative passages. 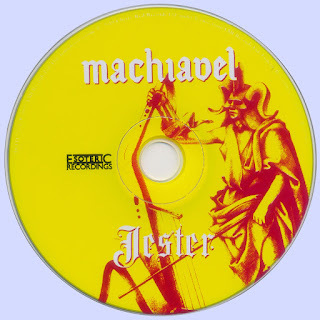 What I admire is Machiavel is they also didn't forget to create great songs, and make them interesting by including some great creative passages. It's probably little wonder why they did so well in their native Belgium. It's amazing how this album even got released! I'm not referring to the music, of course, it's the artwork inside the gatefold of the LP. The gatefold has very sexually explicit artwork. Even so, the artwork is done surrealistically, as often you would see on many '70s prog rock albums, just this one is perhaps the most sexually explicit art I ever seen on a prog rock album, even the cover to Frank Zappa's Over-Nite Sensation is nothing compared to this! EMI (actually its division, Harvest, a label known for acts like Pink Floyd, Eloy, Triumvirat, Barclay James Harvest, etc.) actually released this album despite the artwork. I'm glad they did regardless of how controversial the artwork, at the risk of being banned. There is no doubt about it, Jester is a great album to start if you don't know Machiavel. And if you were turned off by them thanks to a later release such as New Lines, you'll be glad to know Jester is much better. It comes highly recommended!